For any public or private healthcare organization, it goes without saying that patient satisfaction and cost savings are two of the most important parameters. With the healthcare industry exploring digitization in every field amidst the enormous growth in competitive super specialties, digital signage is an efficient and cost-effective way to improve the satisfaction level of patients and healthcare providers. In the ever-evolving healthcare industry, digital sign boards are much more beneficial and impactful than the printed, traditional boards, which are difficult to maintain and update, and hence, are getting outdated very fast. Digital Signage - What is it? How it Works? Digital signage, with digitally enhanced display using LCD, LED screens, is used for advertising, marketing, and communication. A series of display screens for video/ image, interactive kiosks, and touch screen portals can be placed in any public place which offer scope of customer interactions. These networks of electronic display are centrally managed to display text, images, or video messages for advertising, information, entertainment, marketing, and brand promotion to targeted audiences. For any business - restaurants, healthcare, transportation and the like - such screens offer an engaging experience for customers, as well as all necessary support to the business staff for a better work environment. In hospitals, clinics, and also in veterinary practices, digital signage network with multiple screens can be suitably placed throughout, from the entrances and walkways, waiting and consulting rooms to employee workstations and cafeteria. Effortlessly operated digital sign boards help doctors and the management to communicate with their patients, staff, and visitors by providing relevant and timely information from any remote location in real time. This results in better patient care and thus better revenue. Hospitals, especially multispecialty centers, are located generally in vast areas with larger building or multiple buildings grouped together and various departments scattered over. People with health issues are usually in a hurry to reach their respective departments, and guiding them through the building cluster to their destination is often a tedious task. In such a scenario, interactive wayfinding kiosks and building directories would help patients and visitors to reach their needed locations quickly. Secure digital signage platform can be utilized for client interaction at the entrance. Such screens can be placed at the entrance of the hospitals as well as various departments, and walkways to provide necessary information including registration requirements, timing etc. Sign boards can carry information about the required doctors, their qualification, and specialized fields. It can also display doctors' location, visiting hours as well as leave schedule. Digital signage screens kept at the waiting areas help engage patients and their relatives, and reduce perceived wait times. Such screens can display token numbers, videos related to the hospital and healthcare, health-related and other news, facility updates, etc. in waiting rooms. It can also display information and educational instructions related to particular diseases and related fields as well as health and wellness tips. Various ads about socially relevant issues, and over-the-counter drugs can be displayed on these boards. A variety of entertainment content can also be displayed while patients wait for their turn, helping the patients to be more at ease. Further, reviews and successful treatment stories displayed on the board easily connect with patients and visitors, helping them boost their confidence, and calm their minds. The ever-changing texts and visuals can to a great extent make the wait time more enjoyable and less boring. Digital sign boards can also be used for displaying testimonies of patients who already underwent treatments. These references could give support and solace to the anxious patients and their family members. These would also help them to choose the best treatment options. At times of emergencies, digital sign boards could act as an emergency response tool with just a push of a button by displaying alerts and safety instructions. Through a centrally controlled system, the management can trigger urgent messages any time to all digital screens in the facility about urgent requirements like blood, severe weather conditions or warning, epidemic information, etc. These boards help to connect with patients, visitors as well as staff at the same time. Effective communication with employees is a crucial part in any industry, especially healthcare where teamwork is very important. Digital Signage helps to co-ordinate staff in any clinics or hospitals. Digital sign boards, which could be controlled and maintained remotely, can be implemented across multiple locations. Doctors or management can communicate with all their assistants and staff at once by placing digital sign boards in clinic break rooms and staff stations. These boards could be used to effectively train staff about new treatments, show performance metrics, hospital goals, gratitude messages from patients, display awards and industry updates capable of boosting staff morale. They can also be informed about safety procedures, and events in any particular areas of the hospital. Digital sign boards can also display various case studies, especially to train junior doctors. It can be used to display general occupancy information of patient and operating rooms, training procedures, and various reminders. Displaying employee of month, employee recognition's , birthday wishes, etc. are sure to maintain positive relationship with the employees. Digital signage in the staff break room areas will also help to ease their job pressure, and enable them to perform better. In the cafeteria, technically advanced, more convenient, user-friendly and eco-friendly digital boards can be used as menu boards, thereby entertaining and engaging customers and staff. Digital menu boards can be easily updated, saving printing costs. Information about any new food items, the day's special, etc. during the most active times in hospitals, can be changed quickly and effectively with the help of digital signage. The boards can also be used to display nutrition and calorie information, disease -specific diets and even diet-food cooking videos. Digitally operated sign boards are helpful to interact with visitors like medical representatives, insurance companies, and suppliers. Sign boards can display visiting time of doctors, or any concerned officer, that facilitate better hospital management. Brand endorsement is a major benefit of digital sign boards as consistent display of the name of a doctor or a hospital will create a lasting impression about them in the minds of visitors. Digitization is one of the best ways to keep the costs at minimum. Compared to the conventional way, digital boards can easily be updated. In addition, the need of paper and printing is reduced significantly. Maintenance is very easy. Digital boards can be manually or automatically updated with no extra expense. The organizations could also boost revenue by showcasing ads of certain brands and other health related companies and promote products and services. It can also sell advertising space to third parties. Digital sign boards are more convenient, more useful and easy to operate. Compared to the generally used traditional methods, these advanced boards can often change images, and update contents easier and more effectively. How RTTDigital Signage can benefit your healthcare digital signage network? In the constantly changing healthcare world, easily changing displays using digital signage gives the freedom to accept and present the newly gathered information and helps to manage any private or public organizations efficiently and cost effectively, compared to the stagnant, static traditional boards. 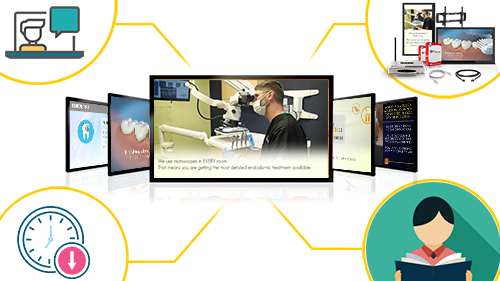 RTTDigital Signage is the right choice and low-cost way in providing Turn-Key Digital Signage Solutions to enhance Healthcare business with a complete hardware, software and content solution. RTT provides state-of-the-art marketing services, and helps to deliver the highest quality content to your audience. We encourage customers to watch a few of the testimonials to learn more about the service and how it helps to improve their businesses environment.